DetroitKnitter: How to take Photos with a pure White Background using a Cheap Camera! How to take Photos with a pure White Background using a Cheap Camera! 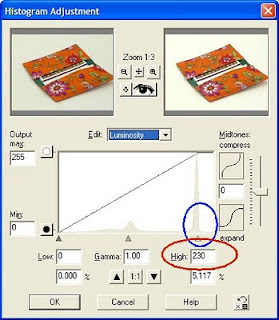 Achieving a white background for a subject photo is not really all that hard and you can do it with many programs including Photoshop Elements which is a free download from what I understand. 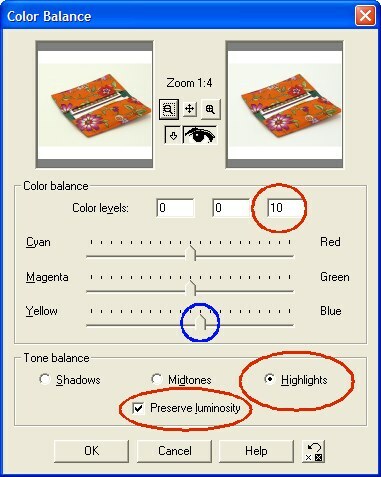 I use Jasc Paint Shop Pro version 7 and I use a 2 year old $200 camera (Panasonic Lumix DMC-TZ4K). Yes, I do like this camera! To the right are two examples of pictures with bad backgrounds. The original is on the left and the fixed picture is on the right (not that you couldn't tell!) 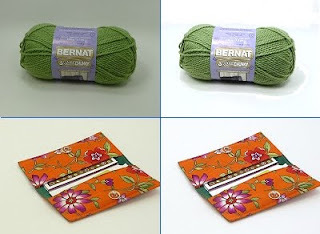 The yarn background was dark and gray and the card holder had a yellow tint. The fixes aren't perfect, but way better than before! The ones I have the hardest time with are the ones that come out with a green-yellowish tinted background. I have some rather simple things you can try; I'm not guaranteeing they will work for you, your camera and your editing software but it's worth a shot, right? MAKE A LIGHT BOX: There are really just a few things to do to achieve awesome photos that look like they are floating. 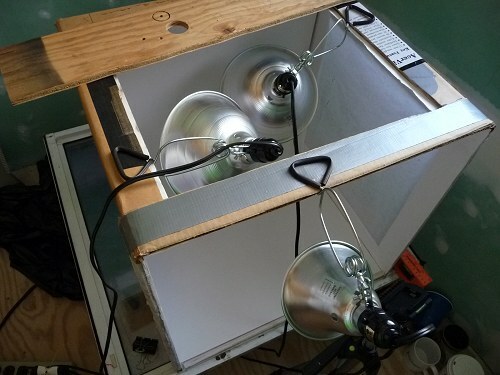 The first thing I would suggest is building a light box. STOP! This is not hard! Honestly. It's pretty much necessary to achieve the totally white background look. There are many resources online for building one. I have now built three and each one has gotten a little bit bigger. I was pretty happy with my 2nd one, but needed it bigger to photograph totes, plus I use it for knitting videos and the one before was a little tight for that. The first one I made was about 16" square, the second one is about 24"w x 24"h x 20"d and the one I just made is 28"w x 24"h x 22"d. The 1st two were made from cardboard boxes and the 3rd is a simple wooden frame; I thought wiser of making one of pvc since the clamp on lights won't hold well due to the round edges. Also for the first two I used wrapping tissue for the sides (which I don't advise since it's easy to punch through) and this last one I've lined with banner making paper from a 4' roll and I've experimented with white muslin fabric - IMO all 3 yielded about the same effect. I also found no remarkable differences between shining the light through from the outside and shining the light directly into the box. The lights are suppose to be filtered so the ones inside the box are pointed at the sides and top rather than directly onto the object. So basically with my cheap camera I still have to do some digital fixing. A quick word about lights. Like many others I use the cheap clamp on lights found at Home Depot and Lowes. The lights are the curly florescent energy saving ones in 120 watt equivalent and I'm using 3 lights. When buying lights look at the specs and pick ones that are at least 5000k; my understanding is that 6000k-7000k are better white lights, but I didn't know that when I bought mine. Oh and they do get hot, so don't leave your light box unattended with the lights on. 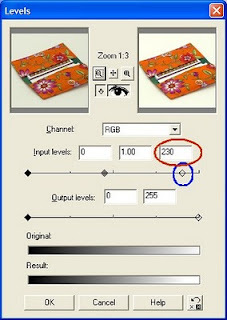 METERING: Change your cameras metering to spot. 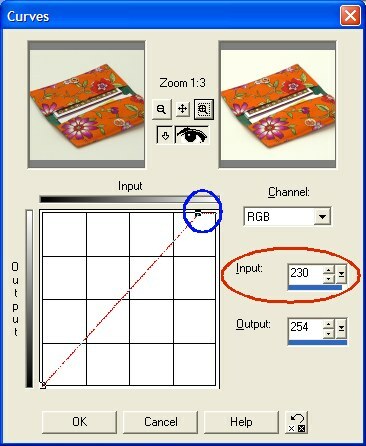 Check your manual or scroll through your tools/settings on your camera to find it. Here's a description of what the different metering options do. STABILIZE: Use a tripod! Or stack up books and set the camera on it; this is important for clear photos. I always use my timer too because even the slightest movement by pushing the shutter button can cause a bit of blur. When taking pictures through the top of the light box, I use a piece of wood with a hole large enough to stick the camera lens through; the wood rests across the top of my light box (pictured above). If I had a fancy tripod that tilted, I would use that, but I don't and I'm thrifty and the scrap piece of wood works just fine. Generally I make my adjustments using the histogram. I'll explain this with the histogram method in mind, but you can look at the pictures and see that this adjustment is done very similarly to levels and curves features. The Highlight/Midtone/Shadow menu does the same thing, but doesn't have a slider. Look at the Histogram window. See the spike to the right of the histogram display window? You want to move the input slider (circled in blue) on the right hand side toward the middle. Ideally the slider should fall right under where the right side of the big curve ends. When you slide it over, you will see the input levels change (circled in red). 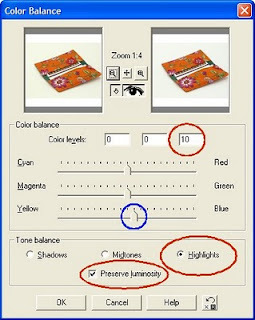 This will even out your picture and bring the darkness more in line with the lightness of your photo. 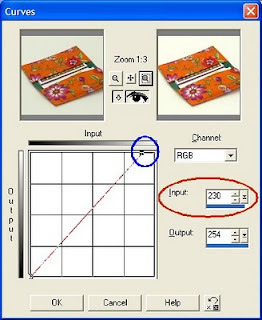 The middle slider represents the gamma and sliding it to the right or left has the same kind of effect as if you adjusted the contrast. 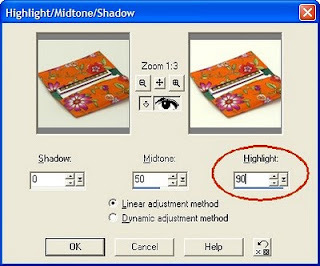 The far left slider brings the lightness into align with the darkness; you would use this if your photo was over-exposed and would move the slider to the very left side of the furthest left curve. Usually the curve of the histogram is much more noticeable, but since I've already posted these photos this is the sample I'm going with (lazy?) Notice in all 4 windows the similarities in the circled items. You should be able to find at least one of these adjustments in your own program or something that adjusts the input/output levels. What I notice with a lot with my photos is that even after adjusting the input levels there is a yellow hue that still remains. Oh it's not too bad, but so easy to fix! I won't include a bunch of photos for this, but basically you want to reduce the yellow highlights and by doing so you will be adding blue as I have done in the color balance window (pictured right). You can also make this adjustment in the histogram window by editing the blue factor rather than luminosity and again lining up the right slider with the histogram curve. Another choice is a Red/Green/Blue adjustment window in which you simply up the % of blue. Final slight adjustments can be made using your Brightness/Contrast adjustment, but be careful not to overexpose your subject along with the background! Trick: If your program allows you, add a white border of say 50 pixels before editing that way you can really see when you have adjusted the background to white or almost white. Crop when done to remove the extra border.